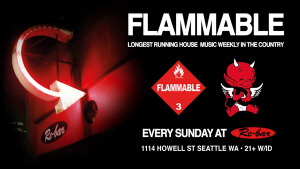 The longest running house music weekly is at the Re-bar every Sunday night! Now in its 23rd year, expect lush sounds straight from the locals to international headlining DJs/ producers every week. Re-bar 1114 Howell St Seattle WA 98101 www.rebarseattle.com 21+ w / ID Cover varies Note: Mixed straight/gay friendly event. All are welcome.